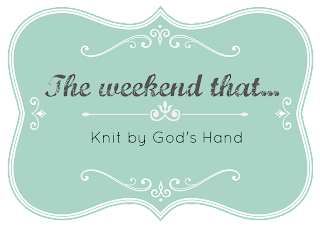 Knit By God's Hand: The weekend that actually had me with NO PLANS!!!!! The weekend that actually had me with NO PLANS!!!!! & not even sure what our plans our. Life has been throwing some things at us - nothing bad - but all our plans that we've had for our week have been changed. So we're taking each day one at a time.... so I'm not sure what my blog will look like this week. Regardless, I know when I left work on Friday - I was one happy girl. There's nothing like leaving work on Friday of your vacation. Just knowing you don't have to turn on the alarm clock for a full 7 days. Bliss. I got off work & headed out to meet up with my Joy Ladies Bible Group for our next session. I ended up getting there a little earlier so I ran over to Meijers for a little bit. Next thing I know, I'm walking out with a few new skeins of yarn, stickers for my Journaling Bible & found they have stickers for Planners. Oh my gosh. Meijers may be my favorite new place. We had 2 of our ladies that couldn't make it for our Bible Study, but 3 of us & a little baby, we still had some great insight, talks & lots of laughter. I also was happy to try out the coffee shops Hot Caramel Apple Cider. OHHHH - the taste of fall in a cup. Saturday felt just weird to me. It was the first Saturday in MONTHSSSSSSS that I didn't have plans or a photo session scheduled. I was like, "What do I do with myself?" Enjoy life - that's what I got to do with myself. I ended up cleaning my house a bit. & was so happy to do it!!! You know how messed up that is when you enjoy cleaning your house? That's how long its been since I done it. That whole absence makes the heart grow fonder? Must be true. I was able to get in a workout, work on a blanket I've got on my knit loom & enjoy a few cups of coffee. Vacation means I don't have to worry about sleep - bring on the coffee! Ricky & I ended up going out to Kohl's so I could find some new blankets for our bed for winter & then we headed to Chuy's for dinner. I could honestly eat Mexican every day. We headed over to Sam's Club & looked around. I went over for the purpose of looking for blueberries. I have missed them for the past few weeks because I just have issues with the price at the grocery. I wish someone could have seen my face when I found a carton ..... & they were $9.99 .... for blueberries. Oh my gosh.... I know I stood over these berries for about 5 minutes having an inner debate with myself if I should get them or not. It felt like vacation just because we were out late on a Saturday night - like a real date. We're basically 80 years old at heart because we never stay out late. Probably a good thing - the whole way home, I complained that I couldn't see to drive in the dark. We ended up just finishing the night watching Monsters University. My kind of Halloween movie. Some people enjoy those slasher films or movies where paranormal activities are full force. Give me ABC Family Halloween movies. Sunday, for some stupid reason that shouldn't happen on vacation, I was up at 6:30am. I ended up turning on Gilmore Girls & trying to catch up on some more episodes. With the news of the show coming back, I am now on a mission to get through all the seasons. A long road ahead. Ricky & I ended up heading to our friends for home church & just always enjoy getting to spend time with our friends. We headed out from there to look for me a new car - we found out interest rates are CRAZZZY low for cars right now & I despise my car in winter, plus, I'm the worst in the world at navigating this baby. Ask Ricky. Or anyone that has ever rode with me in it. .. but as we were heading out, I just wasn't in the mood. It takes a lot for me to look for a car. Like it exhausts me to think of decisions of picking a car & the math that's involved in figuring car payments.... I just couldn't do it - not on a pretty fall day. So instead, we went out & got some lunch & went to Target & then stopped at our local coffee shop. A much better decision to handle a beautiful Sunday then dealing with car salesmen. It was a pretty lazy Sunday after that... again, something I really could get used to... seriously. I may be sleeping - I may be watching Gilmore Girls... you just never know. yesssss staycations with ZERO plans are the best. with life so incredibly busy and pulling you every which way, you need days like that! enjoy! so wonderful! that is the best thing!! it sounds like you have enjoyed it and have been able to sleep in, minus Sunday! We had Chuys on Saturday too. I love that place. "Bring on the coffee"..... still cracks me up that you're drinking coffee now!!! Chuys is one of my favorite places... give me a plate of their chips and the creamy jalapeno and I'm a happy girl!!!!! Sounds like a great weekend! It's so refreshing when you have a rare weekend with no plans. And a whole week? That's awesome :) I was so excited when I saw that the Gilmore Girls may be coming back. Sounds like a fabulous way to start a week off ... enjoy it! Is Ricky off, too? You crack me up! I love weekends with NO plans! Enjoy every second of it! What a nice way to ease into vacation! No plans on a weekend rules. I'm with you on the car purchasing...not my favorite thing at all. I actually don't do it anymore. MFD does it. Not having to wake up to an alarm for a full week is the best! Can't believe you had nothing on Saturday. Awesome! Enjoy it! I've been rewatching Gilmore girls, too - loving it and CANNOT WAIT for the reboot! 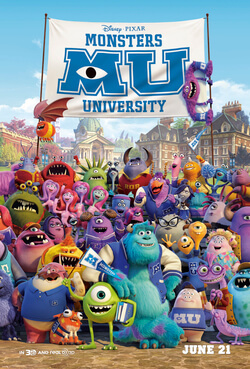 I still need to see Monsters U - it looks so cute :) Happy vacation! I really want to see Monsters U! I think my next show to binge watch will have to be Gilmore Girls...even though I did it October-January last year. I just need to do it again before the new ones are out on Netflix! I'm glad you got to have a weekend with no plans!! I could totally eat Mexican every day too!!!! And you know my love for Chuy's. And Kohls! :) I am with you on your choice for Halloween movies. I hate scary stuff, I refuse to watch it. Pretty Little Liars and Hocus Pocus is about as scary as I get. Hope you enjoy your time off!!! i love cleaning my house lol. no shame! i don't do it often, but i love it when i do. i hate scary movies, so monsters university is way more my speed! You guys deserve a weekend of no plans!! Good for you! And yay for Gilmore Girls, it's my mission to re-watch every episode, too! A weekend with no plans?! Shopping, coffee and Gilmore Girls.. I need one those. With your Friday Favorites I was going to say "how about doing nothing this weekend" because you are always so busy. Didn't know you were taking a vacation! How awesome for you. I love Monsters Inc. I also love Gilmore Girls and watched them when they were on. Would be fun to watch them again. Off for 7 days?! GAHHHH! I'm jealous!!! I hate the actual act of cleaning but there is NOTHING better than the end result, is there?! Lunch, Target and coffee sounds like perfection! I've been debating about watching Gilmore Girls over again, I had stopped watching so I don't know what happened in the end. Sooo....did you buy the blueberries? I can't believe that price! My brother in law owns a small car dealership in Louisville, so when it's car buying time for us, it's easy peasy! It's nice buying from someone who is honest, who you can trust. Love Chuy's! Sounds like a fabulous weekend :) Do you follow Jen Hatmaker on Facebook? She just finished watching the whole Gilmore Girls series - she is hilarious. Love me some Gilmore Girls! So glad you had a relaxing weekend. I have to say, I'm pretty jealous of your vacation! Enjoy every second!